This mod will make herb bushes produce more herbs per day. White Myrtle and Celendine will add 5 herbs every day, Hellebore will add 4, and Berbercane, Balisse, Crow's Eye, Sewant Mushrooms, and Verbena will add 3. (White Myrtle and Celendine are ubiquitous, so I made those quite plentiful; the other herbs seemed less common than the first two, so I thought I should make them a bit scarcer). The new scripts tell each bush how many herbs to fill itself with when it replenishes itself. Each type of bush calls its particular script once a day, but they don't all do it at the same time of day, so THE NEW NUMBER IS ONLY PRESENT AFTER THE SCRIPT HAS BEEN CALLED FOR THE FIRST TIME. For some herbs, this will be right away, for others, it won't happen until a (game) day has passed. Once downloaded, you'll have a (7zipped) folder called Plentiful Herbs. Inside that folder are eight 7zip files; each zip contains two script files for that particular bush. I've packaged the mod for each bush separately, just in case you only want to modify some of them. Each 7ziped folder is labelled with the English name of the herb, not the name of the script, since some of the scripts have Polish names and others have English ones. Choose the herbs you want to make more plentiful, unzip those files, and put the script files in your Override folder. If you don't have an Override folder, just make one. Every time someone has contacted me about this mod -- except for the people who just wanted to say thank you, which is lovely -- it has been to say, "I used this mod, but the bushes still only have 1 herb apiece." I ask how long they waited before checking, and they say, "Waited?" So, let me repeat: The bushes replenish themselves once a day, and the new number of herbs will only be present after the bushes have replenished themselves. Depending on what time of day it is when you add this mod, the new herbs could be ready in an hour, or they might not be ready until the next (in-game) day. Delightful McCoy has -- with my permission -- modded a few of the other herbs to be more plentiful, using my script as a base. 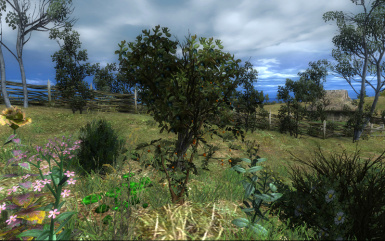 You can download the herbs that she has made more plentiful at the official Witcher forum. Neither of us has modded Beggartick or Feainnewedd, since the game makes a big deal out of both of those being rare.